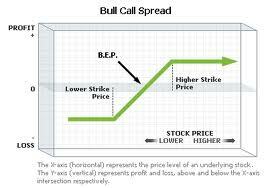 Bull call spreads are option trading strategies involving the simultaneous purchase of call options at a lower strike price and shorting (selling) the same amount of call options at a higher strike price. Both long and short positions will have the same expiry date. They are called "bull call spreads" because you enter them on the understanding that the outlook for the underlying financial instrument is bullish and you're creating an overall debit position in your account using call options. Being a vertical debit spread, the bull call spread will enable you to enter a position much cheaper than simply going long the call options, as well as allowing greater flexibility if the underlying share price should not proceed in the anticipated direction. 1. Search the market or analyze your watchlist for a stock you expect to be modestly bullish. Look at a chart showing trends and price action for at least the past year, to determine where the stock is in its overall price cycle. 2. Ensure there are options available for this stock and that there is sufficient liquidity to enter and exit the trade easily, without being at the mercy of market makers. 3. Bull call spreads are most effective for options with at least 90 days to expiration date, so check option premiums for strike prices with at that timeframe. You may even wish to consider using LEAPS options for this purpose. 4. Check the implied volatility in the option prices you are considering, to see if any are overpriced or underpriced. Overpriced options for the short leg of the trade give you an advantage, but they are not essential to a successful trade. Beware of overpriced premiums for the long (bought) leg of the spread. 5. Decide which lower and higher strike prices are most appropriate for your spread. You should consider at least 10 percent of the current market value of the share price as a basis for your strike price difference. (ii) Limited Reward - the difference in strike prices minus the net debit to place the trade. (iv) Return on Investment - the maximum potential reward divided by the amount risked. 7. Create a risk graph to visually represent the trade's potential. You can use freely available downloadable software such as from Peter Hoadley for this purpose. Or if you're in the USA and use the ThinkorSwim trading platform, it comes gratis. Other reputable options brokers have similar features but they are much less sophisticated. 8. Make a note in your trading journal of the details of the trade and the reasons why you chose it. 9. Plan your exit strategy before placing the trade. For example, you may consider exiting half the trade once its overall value has doubled, leaving the remainder as a risk-free trade, which you could let run without stress for greater profit potential. Or you may simply wish to set a target such as 80 percent profit for your exit. Option prices work in such a way that the last 20 percent usually takes much longer to realize in a verticial debit spread, so your money would be better used elsewhere. 10. Contact your options broker or go online and place your bull call spread. Make sure you do it as a limit order to minimize the cost of the trade. 11. Watch the market in the ensuing days. If it falls below the breakeven but you believe it will rise again, you may wish to consider waiting till the (higher) short position is very cheap and closing it out. This will leave your long position still current - and even if the stock only returns to its original price, will usually make you a profit. This strategy is best suited for a stock that has already made a sustained downwards move before you place the trade. Otherwise, go to the next step. 12. Decide when to exit based on what happens to the underlying stock. (i) If it rises above the short strike price - the maximum profit becomes available and moreso with the passing of time as option theta (time decay) goes to work. (ii) If it rises above the breakeven but not as high as the short strike price - close out the entire position for some profit. (iii) If it remains below the breakeven but above the long strike price - there may still be a small profit in it, if time value or implied volatility works in your favour. Decide whether to close the trade or risk waiting until expiry date and then sell the long call while letting the short call expire worthless. (iv) If the underlying stock falls below the long call strike price - consider the strategy in point 11, or close the entire position if you think the stock won't recover.